The sun set with glorious colour, but as I drove home the rain started. It rained pretty hard that night, I measured 58mm of rain, but Wednesday 24th was wetter, with over 100mm, and Thursday had 75mm. I guess August decided it did not want to be below average! It's been a real month of 2 halves.. the first half of August I measured 27mm of rain. And in the last 10 days, more than 400mm! The local news websites told of a man who had touched a live electric socket in the rain and died on Thursday morning. And then there were some floods here and there, mostly in Patong. Also the wind and rain on Thursday morning delayed some flights in and out of Phuket. 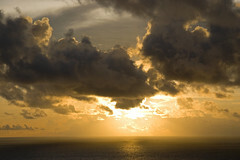 Check reports in the Phuket Gazette and The Phuket News. 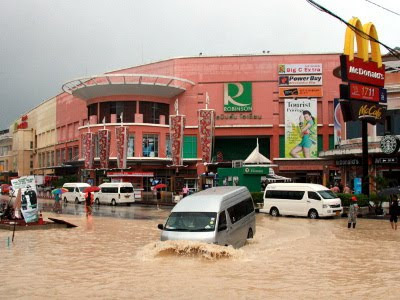 Patong always seems to have flood problems when it rains hard. Water runs down from the hills and with natural drainage lacking due to everything being covered with concrete, the water finds place to sit and so roads get very wet ... Not good driving conditions, I read in the news about a couple of accidents that were certainly due to the rain. Young kids do tend to race bikes, and in the rain they'll shield their face with their hand, and ride faster in order to get out of the rain quicker. On wet roads, especially over the hills, you have to drive carefully. Looks pretty bad, but I understand the floods only lasted half a day in most places. On that very wet Thursday I drove 20km from home near Phuket Town to Karon Beach about 8:30am via Chalong, and saw no floods. And drove back about 4:30pm and saw no floods. So large parts of Phuket were not affected. Yes it was very wet, but flooding was localised. Be careful what you read, as some news reports made it sound like 2012 "The worst natural disaster since the tsunami" was something I read on a website that I will no longer read or mention, quite ridiculous reporting. The word "flood" does tend to sound bad, but if a road is covered by a big puddle, some people will call that a flood. I am sure some parts had bigger floods and I am sure some houses and businesses may have got wet, but this happens pretty much every year to some degree. Over the last few days I have driven around 300km without seeing any floods. Certainly if anyone was on holiday in Phuket over the last week, you've not had the best time! Nobody wants to go for a stroll on the beach in the rain! I mean, it was not raining non-stop, there have been breaks, but this morning (30th) is the first sun I have seen for a week - apart from about 10 minutes yesterday afternoon. It's not normal to get a whole week of crappy weather like this. Low season storms tend to blow in from the west and last about 3 days. This last week has been a drag.. but the sun is shining now. The weather radar shows no rain, the forecast is good. Note that on this blog are several very useful weather tools - look at the top left of the page - links for webcams, weather radar, satellite pictures and the very good Windguru forecast. I hope to get out somewhere today and take a few sunny photos - my camera did not come out this last 6 days - I don't fancy taking "wet day photos"! Looks like the next week will be sunny again, I think the sky is all rained out. We've got builders in our house today, going to retile the bathroom and build a new ceiling. Nice day for it! • Phuket Hotels - Have a look at Agoda.com!